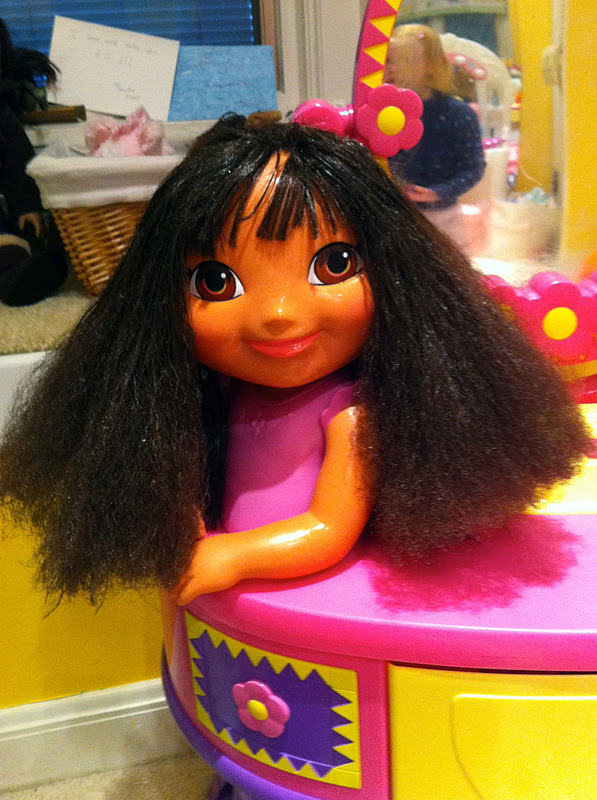 A few months ago I asked for some advice on taming the hair on the girls' Dora vanity table. I bought a wig brush, but I couldn't even begin to get it through her hair. Then I stupidly left it with the table and the girls gave it a shot. Do you see the brush in the photo on the right? It was stuck! Clearly, the hair was much worse and so I gave up and kind of forgot about it. 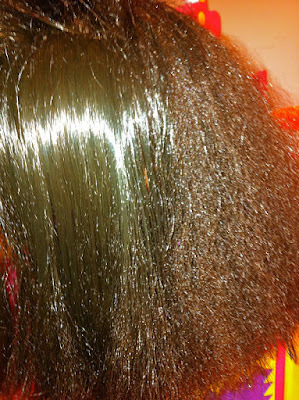 Last week I saw friend's pin to this tutorial on taming doll hair. 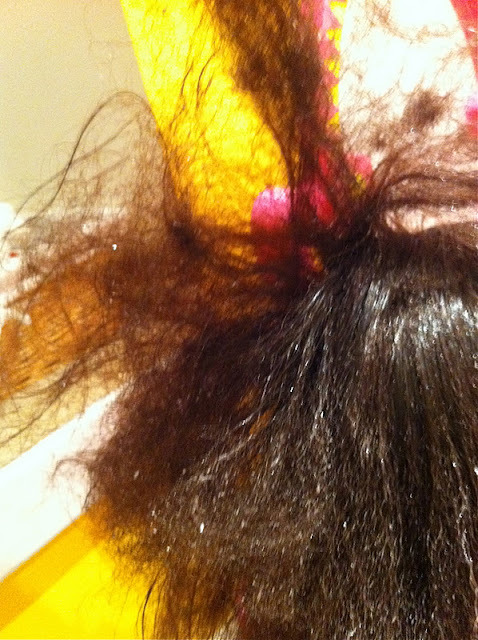 It involved the wig brush (which I already had once I pried/ripped it from the knotted locks) and a spray bottle filled with a fabric softener/water mix. It took a lot of spray, a lot of patience, and a few lost "spokes" from the wig brush, but eventually it started working. Can you tell which half is brushed? Dora lost some hair in the process too, but look at the snarls and craziness I was up against! 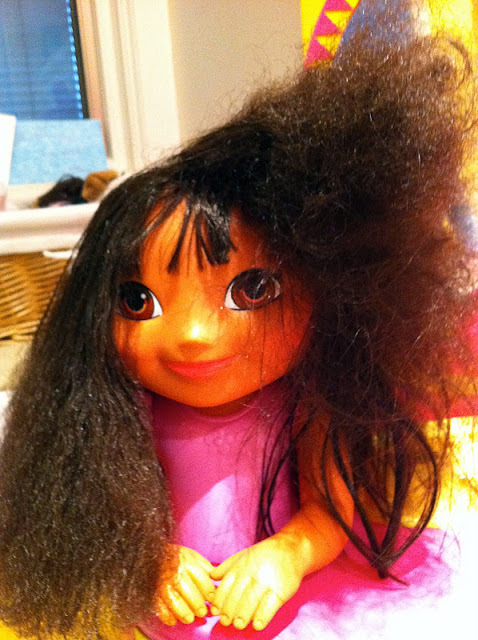 A friend of mine recently told me about how his niece's AG doll was checked into the "hospital" due to hair issues. In the end, they sent her doll back with a new head because the hair was too far gone. Oh, how I longed for that to be an option during this process. It took a really long time! Her hair is super damaged, as you can see in the photo below. All of this hair is combed through, but the back suffered less & so returned to a semi-straight look. The sides were not so lucky! In the end, this process was worth it. 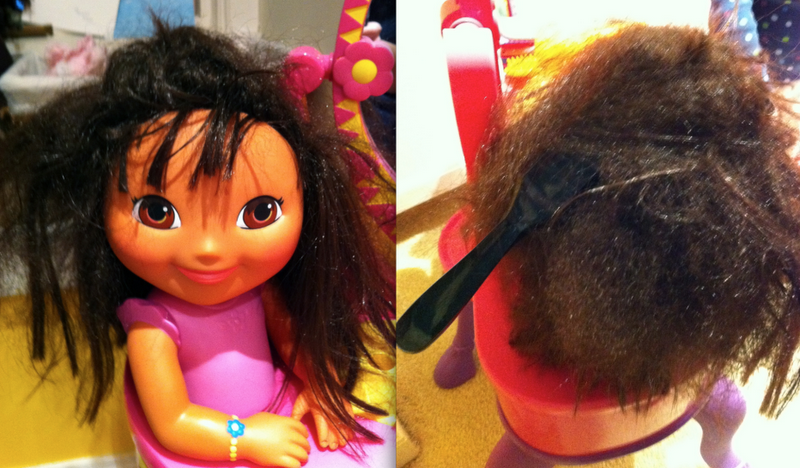 Dora's hair has no knots (or things stuck within) and you can run a brush through it. On the downside, it is greasy to the touch and will apparently always be styled a la Diana Ross. It's not exactly "new head" condition, but it's much closer than before! Thanks for that good laugh this morning. I needed it. For future dolls, the key is to keep if from getting that bad (duh). Spray the hell out of it with water before you comb. 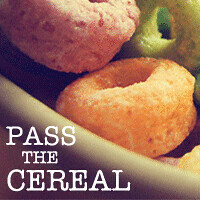 I learned that from the AG salon people. This entire post cracked me UP. A LOT! Love the Diana Ross comparison! Can't believe you had the patience to invest that much time. I would have gotten too frustrated. It does look better, a lot better. :) needed that today too!! You are such a good momma! Good to know about that spray too..hopefully the hair will be less greasy with time..